Following the success of our 2017 workshop day on Tippett A Child of Our Time, our next workshop event in May 2018 will be looking at Igor Stravinsky’s Symphony of Psalms and Leonard Bernstein’s Chichester Psalms. Once again the day will be led by experienced choral conductors John Hancorn and Nick Houghton, with special guest accompanist Nancy Cooley. Mountfield Road, Lewes, BN7 2XH. Ticket price: £20 earlybird price – up until 19 May (after 19 May the regular price is £25.) We recommend buying your ticket in advance as last year’s workshop was full. The ticket price includes music hire. How to book: To reserve your place on the workshop, please email workshops@musicsussex.org.uk stating your voice part (soprano, alto, tenor or bass). We will reply to confirm your place and send you options of how to pay. In 1930 Stravinsky was commissioned by Serge Koussevitzky to write ‘something popular for orchestra alone’ to celebrate the 50th anniversary of the Boston Symphony Orchestra, and the result was the Symphony of Psalms for Chorus and a large orchestra omitting all the violins and violas! It is partly because of this unusual (and expensive) orchestral accompaniment that the piece is not often performed by amateur choruses. Symphony of Psalms is one of the major pieces from Stravinsky’s Neo-Classical period. The second movement is a double fugue: the orchestra begins with one fugal theme and is then joined by the chorus, which sings in Latin, with a fugue on a completely different theme. The final movement is one of Stravinsky’s most popular, which ends with a beautiful, atmospheric and almost hypnotic setting from Psalm 150 of ‘Praise him with the well-tuned cymbals’ – with not a cymbal in sight on the stage! The Rev. Walter Hussey during his lifetime commissioned an extraordinary amount of work from some of the finest artists of the day. Leonard Bernstein’s Chichester Psalms is just one of thirty or so pieces of music commissioned by Hussey, composed in 1965 for the Southern Cathedrals’ Festival. When approaching Bernstein, Hussey emphasised that the composer should not feel ‘hemmed in’ by the English Cathedral tradition in music – ‘many of us would be delighted if there was a hint of West Side Story about it.’ Bernstein obliged, and his new piece was first performed in Chichester Cathedral in July 1965, during which time Hussey played host to Bernstein and his family — taking them on day trips to Stonehenge, Brighton and Bosham harbour. Although written in Hebrew, the chorus parts of Chichester Psalms (which Bernstein called ‘perhaps the most tonal score I have ever written’) are helpfully transliterated. The opening movement, in a jaunty 7/4 metre, is a setting of Psalm 100 ‘Make a joyful noise unto the Lord’. The 2nd movement is a lovely setting of Psalm 23 ‘The Lord is my Shepherd’. And the final movement (Psalm 131) has a gently lilting melody. 2018 is the centenary of Bernstein’s birth, so a fitting time to be singing his music! Our publicity material features the famous window by Marc Chagall at Chichester Cathedral because it links our two pieces rather nicely. The window was commissioned by the Rev. Hussey twenty years after the Chichester Psalms. Bernstein and Chagal were both Jewish, as are the Psalms of David. 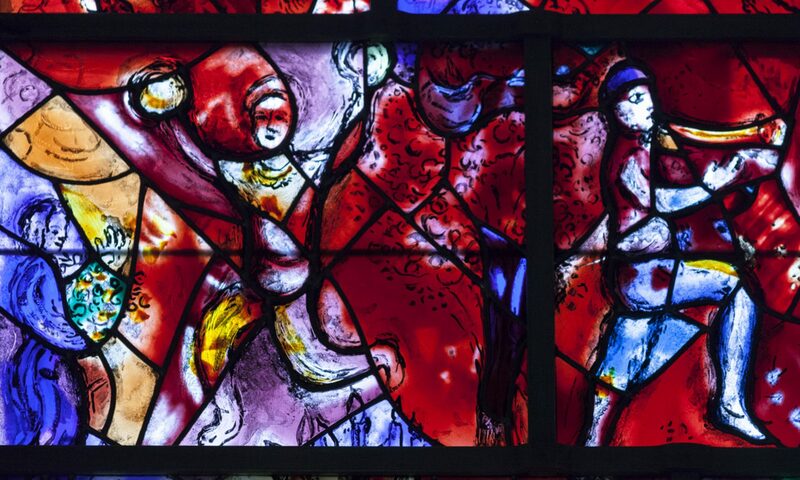 Chagall’s window is based on Psalm 150 and depicts all the musical instruments featured in that psalm, which also provides the text for the 3rd movement of Stravinsky’s Symphony of Psalms. Here’s the Stravinsky’s Symphony of Psalms conducted by Pierre Boulez – this recording has a nice clear sound, althought the first second is missing! This is the Stravinsky conducted by Sir George Solti – with full score to follow along. and here’s the Bernstein performed by a young orchestra and choir. The Performing Arts Centre at Sussex Downs College is a modern, comfortable building and is ours for the day. There’s plentiful free parking on site and it’s only a short walk from Lewes Station and the town centre. There will be a break for lunch. You are welcome to either bring a packed lunch or head out to one of Lewes’s many cafes and pubs.